Michael has played on 500+ recordings and studied with jazz legend Jaco Pastorius. 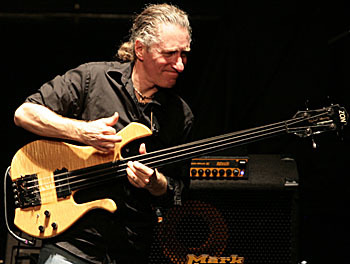 He was the house bassist for the Windham Hill label in the ’80s and has put out seven solo albums since then, with increasing focus on solo works. He expands what electric bass can do by using many tunings, even retuning on the fly using a custom-built system, using his bass as a percussion instrument, and sometimes playing multiple basses at once. We also talk about looping, amplification and processing, and more. We discuss “Excuse Me, Mr. Manring” from Soliloquy (2005), and “My Three Moons” and “The Enormous Room,” both from Thonk (1994). The opening music is “Thunder Tactics” from Unusual Weather (1986), and we wrap up by listening to “Unclear, Inarticulate Things” by Attention Deficit, his trio with Alex Skolnick (Testament) and Tim Alexander (Primus), from Idiot King (2001). Learn more at manthing.com. Here Michael discusses and shows more of that rhythmic approach to bass playing. Here’s Michael explaining the Zon Hyperbass and introducing “The Enormous Room” and then playing it. Here he is playing “My Three Moons” live on four basses. Here he is doing some looping in order to play along with himself. Here’s another one of his trios: this one with Vic Stevens and Scott McGill. Here he is in 1996 playing with Michael Hedges. Here’s another interview with Michael where he talks about Jaco and other things. Here’s another where he talks about Michael Hedges, Montreux, the “stigma around bass,” and other things.